Is something unusual starting to happen to the crust of our planet? The USGS defines any earthquake of at least magnitude 4.5 as "significant", and there were 53 earthquakes that met that criteria along the Ring of Fire on Sunday alone. Not too long ago, I wrote about how "Earth changes" seem to be accelerating all over the world, but even I was stunned by the ferocity of the seismic activity that we witnessed over the weekend. Because none of the earthquakes happened in the United States, the mainstream media almost entirely ignored this story, but that is a huge mistake. 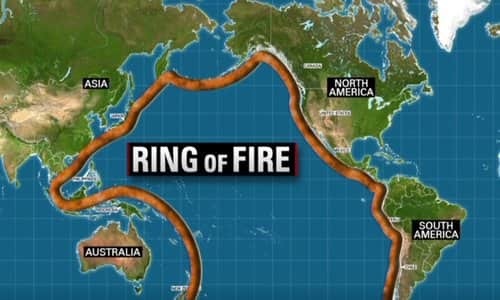 The entire west coast of the U.S. falls along the "Ring of Fire", and experts assure us that it is only a matter of time before the seismic tension that is building up along the tectonic plates in that area is released. Fiji falls in the Pacific Ring Of Fire - a massive horseshoe-shaped area in the Pacific basin. Roughly 90 percent of all earthquakes occur along the Ring of Fire, and 75 percent of the world's active volcanoes are dotted along the expansive ring. The USGS calls these "deep focus" earthquakes, and while some of the biggest earthquakes to strike the earth are deep focus, their depth usually minimises damage. But until big earthquakes start happening here, many Americans simply will not pay any attention to all of this. What they need to understand is that this is truly a global phenomenon that we are witnessing, and shaking in one part of the globe can have tremendous implications for people literally living on the other side of the planet. In particular, those living along the west coast should be deeply alarmed that seismic activity along other areas of the Ring of Fire appears to be intensifying. Scientists warn increased seismic activity in the area may mean the so-called "Big One" killer earthquake is on the way. Sadly, the truth is that we would be extremely fortunate to only have "tens of thousands" killed in the event of a historic earthquake on the west coast. Two major earthquakes have hit the Bay Area in modern history. In 1906, a 7.9 magnitude earthquake hit San Francisco and 80 percent of the city's buildings fell or burnt to the ground, leaving 300,000 people homeless and killing nearly 3,000. In 1989, a 6.9 magnitude quake caused the ground to liquefy in parts of the city and collapsed highways, killing more than 60 people. Unfortunately, the experts assure us that the "Big One" is definitely coming to the west coast at some point, and all of this seismic activity may be an indication that it is coming sooner rather than later. Learn more about the convergence of earthquakes with other end times signs in our special DVD "The Coming Convergence" available here.